Sony’s excellent full-frame A7 camera and 28-70mm lens kit at its lowest price ever! This unbelievable Black Friday deal sees the price of Sony’s original A7 camera and FE 28-70mm f/3.5-5.6 OSS lens kit cut by a staggering amount. 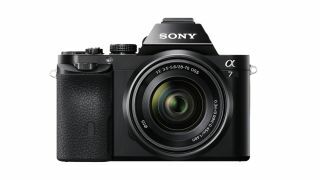 The Sony A7 was the first full-frame compact system camera on the market, and although it’s been superseded twice now, the fact that Sony has kept it available should speak volumes as to just how relevant it remains. And at this incredible price it's an opportunity not to be missed if you're looking to buy your first full-frame camera. Right now, this Sony A7 and lens kit is the cheapest it has ever been, reduced on Amazon UK down from the RRP of £1549.99 to £659. But the savings don't stop there, you can also claim £150 cashback from Sony on a purchase, taking the actual price you pay down to a staggering £509. That's ridiculously cheap for a full-frame kit, and is more than we saw the A7 reduced by on Amazon Prime Day. The Sony Alpha A7 (also known as the Sony ILCE7KB) was the company’s first foray into the world of full-frame photography. Inside its compact body, the A7 boasts a 24MP sensor that's capable of capturing Full HD videos to 60p. A tilting LCD and high-resolution electronic viewfinder help you compose images and videos with precision, while Fast Hybrid AF and Eye AF are also on the specs list – as is Wi-Fi and NFC connectivity. And as you’d expect, image quality is fantastic. The A7 represents a fantastic (and now ridiculously affordable) entry-point into full-frame photography for anyone who’s been thinking about stepping up to the next level. This is the best Black Friday camera deal we’ve seen so far. Grab the brilliant full-frame Sony A7 and 28-70mm lens kit for just £509 (with cashback from Sony).